The first time I baked a pumpkin I spent a good part of my day (and box of bandaids) on the venture. The end product tasted great and I was glad to avoid eating something out of a can, but in my mind it just wasn’t worth the effort. There had to be an easier way to do it than halving, scooping, peeling, and chopping before baking, I thought. And guess what? I thought right. There is a much easier way! Start with an organic pie pumpkin (one of the little guys). The larger jack-o-lantern pumpkins are grown for size, where as pie pumpkins are grown for flavor. Create 5-6 deep cuts around the circumference of the pumpkin, making sure to cut all the way to the center. These gashes allow hot air to escape during baking, ultimately enabling the pumpkin to steam itself. 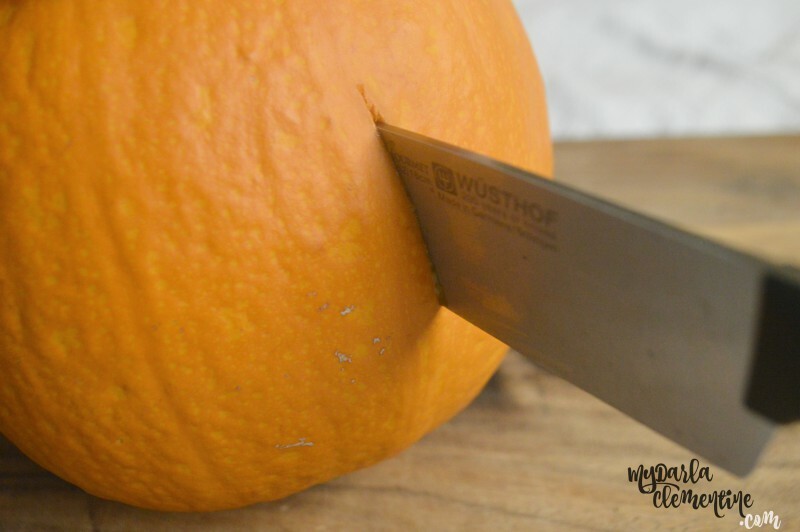 You’ll never have to cut the raw pumpkin open at all! To test if the pumpkin is done, stick it with your knife. It should very easily puncture the skin and slide right in. If it doesn’t, bake for another 10-15 minutes and try again. After baking, your pumpkin will slice in half VERY easily. We are talking no-bandaids-needed status. Do be careful of the heat trapped inside though! Scoop out the seeds (very easy to do after the baking has taken place) and create grid slices in the meat. Loosen the chunks out with a spoon. Transfer to container appropriate for your desired purposes; refrigerating, freezing, or pureeing right away. I use mason jars for the pumpkin (just like I use them for nearly everything else). 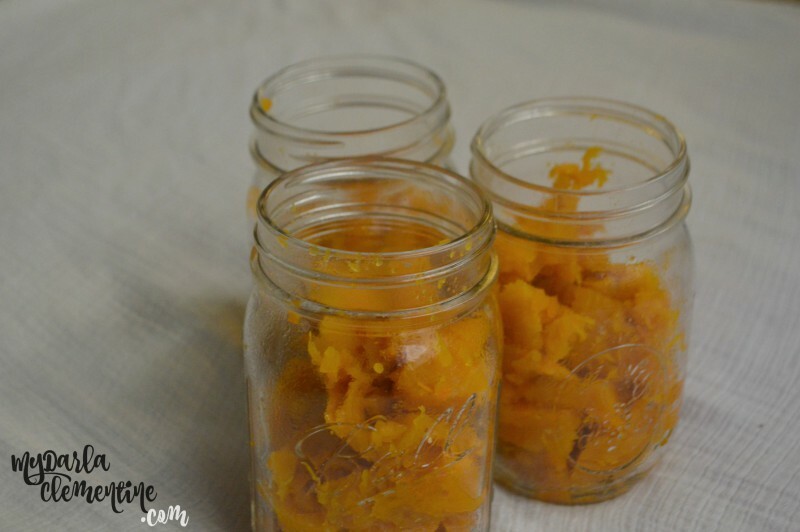 In this particular case though, the greatest perk about mason jar storage is that the pumpkin can be pureed right in the jar using most blender blades! Screw the blender blade onto the jar like a lid, flip the jar upside down, and stick it onto your blender. Puree. Note: The pumpkin chunks compress when pureed, so if you are following a recipe that calls for a certain measurement of puree, be sure to measure it after the blending stage. Want to make your life even easier? Puree pie filling ingredients right in the mason jar along with your pumpkin meat. This saves you the trouble of washing any extra dishes… not a single mixing bowl, beater, or spoon! Baking time for a pie will be about 50-60 minutes, will these little pie cups only take about 20 minutes. In either case, you’ll know the filling has baked through when the center has set. This post was shared on Simply Natural Saturdays, Modest Mondays, and Titus 2 Tuesdays. I honestly never considered using anything but canned pumpkin before reading this. Thanks for explaining about the different types of pumpkin! You made it look so easy I can’t wait to try it! Pinned! Oh what a fun thing to do!!! That’s great! Thank you for this tutorial! I never really though about doing anything other than buying canned. Since we moved to Europe, they don’t have canned pumpkin, but they have plenty of whole pumpkins. I’ll have to do this! Thanks so much for breaking it down in a helpful tutorial. You make it look much easier than I thought. I’ve also been using canned for years, but am now considering making it fresh for pumpkin pie this year! Definitely not hard! I have three pumpkins to throw in the oven this morning. It’s healthier too. You can do it! I love how simple this is! I’ll have to remember this next time my dog isn’t feeling well. He loves pureed pumpkin when he’s sick.